Brand new to the US for 2017 is this Cat Toy Box from Tribal Produce. This fun interactive puzzle box for cats was first seen on the UK television show ‘The Secret Life of Kittens’. Now it is also available to customers in the USA. 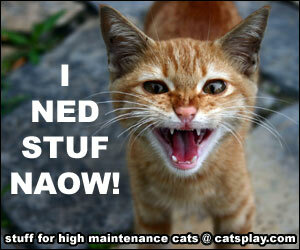 Both indoor and outdoor cats enjoy stimulation. 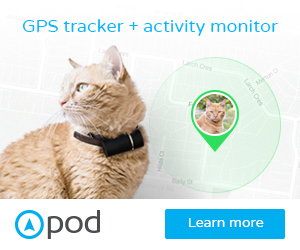 If you have an indoor cat then this is even more important. 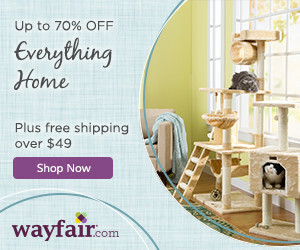 Puzzle toys such as the Cat Toy Box stimulates play in your cats by encouraging their curiosity. And it keeps their minds active as they try and puzzle out how to catch the hidden balls and mice. How many times do you find that your cats love to chase your feet when they are hidden from sight? Well, this box works exactly the same way as the large box has multiple holes in it. Both on the sides and on the top. Each hole is big enough for your cat to push their paw through. But unlike other puzzle boxes, the Smitten Kitten Cat Toy Box has only one side hole which is big enough to let the balls out. 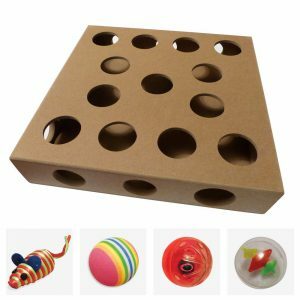 Therefore, your cat will have endless fun trying to push the ball out through the correct hole. The cat toy box comes with three balls and a mouse toy. You just need to put the balls into the box and rattle it about to encourage your cat to try and get the ball back out. 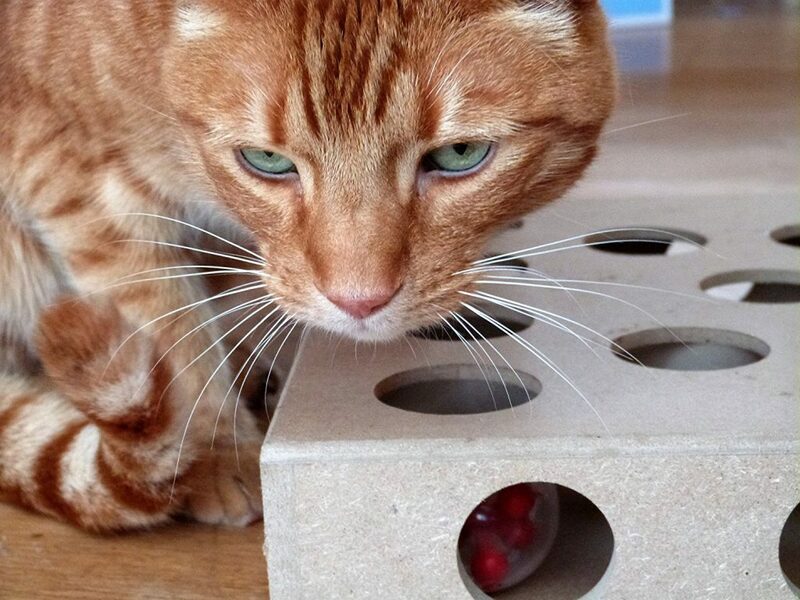 Some puzzle boxes actually have small holes so that there is no way that your cat can actually get the ball out. This means that your cat can get fed up with the toy after a period of time as their predator and prey instincts make them actually want to capture the ball. In this case, Smitten Kitten actually has one large hole that your cat can force the ball through. Therefore, whilst it is difficult for them to actually find this hole – they can actually have a successful hunt. Tribal Produce themselves are a small family business. Their Smitten Kitten box looks simple but is quite hardwearing as it is made from a mix of hard and soft wood compressed into a medium density fibreboard. This makes it strong and smooth to the touch and it is safe for cats and kittens. Plus it is strong enough to handle multiple cats playing with it at once. Size wise the puzzle box is about 11.4 inches by 11.4 inches and around 2.5 inches deep. It comes with three different types of ball, plus a brightly colored mouse. One of the balls is a slightly smaller ball than the others which cats will find easier to get through the larger hole. This encourages them to keep playing and you can then add the larger, more difficult balls for extended playtimes. However, if your cats do not like the included balls then you can use any other ball of your choosing. My cats especially love crinkly balls and these work well inside this box. 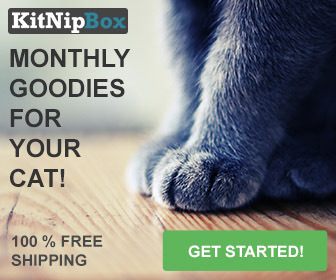 Or you can even pop some treats inside the box and see your cats attempt to get these out of the holes. If your cat doesn’t initially feel attracted to playing with the box then add some catnip, like Meowijuana, inside to entice your cats to play. 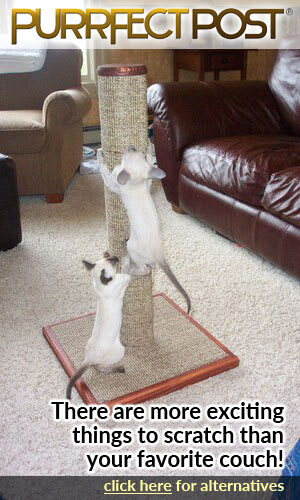 Another tip to keep your cats occupied and mentally stimulated is to rotate the balls around. Maybe use a rattle ball one day and then a crinkle ball at another time. 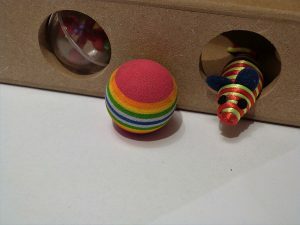 As one of the supplied balls is smaller than the other two then you can start your cat off with this ball which they will find easier to get through the large hole. You can then rotate to the larger balls which your cat will find more difficult to get out of the box.